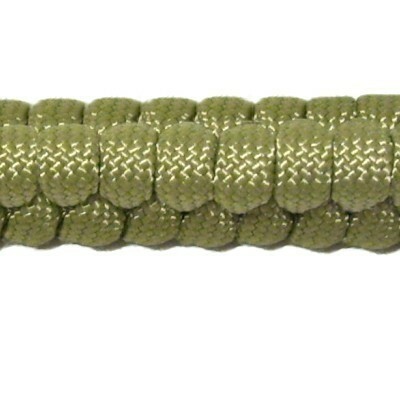 Description: The Rattlesnake Bar is a very unique variation of the Switchback design. It has three segments, and the one in the center is raised. So it looks just like a rattlesnake's tail if you make it around a loop. This is a thick, sturdy design that makes a great decoration for a key ring. With flexible material you can make a bracelet, belt or strap. The advantage to tying this design around a loop is so you have part of that loop available for a clasp, or to attach a key ring. This pattern can be made with four cords, too. This design is on the Fusion Knots website. Cut one cord 9 x the finished length of the item you wish to make. When practicing, the cord should be at least 60 inches. 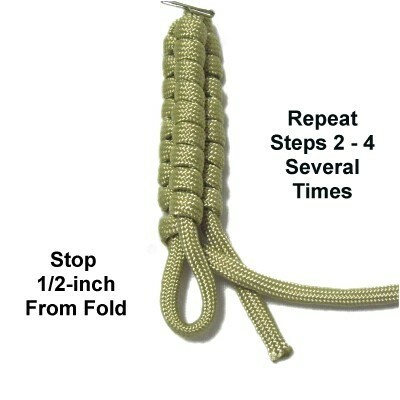 Read the bottom section of Cord Preparation to learn how to prepare the tips if you plan to use Paracord. Step 1: Start from one end of the cord and measure it 2 x the finished length. Fold it at that point to form a loop, crossing right over left. Make sure the short tail is the RIGHT portion. Adjust the loop so it's the finished length you want to make. 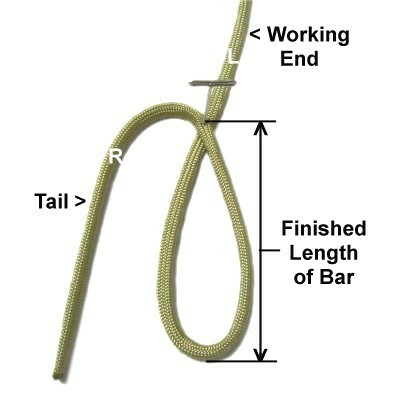 The short tail should be 1-inch longer than the loop. 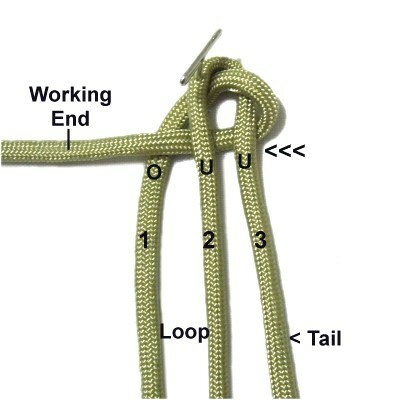 Bring the short tail to the right, passing under the working end of the cord. Arrange it vertically next to the loop. 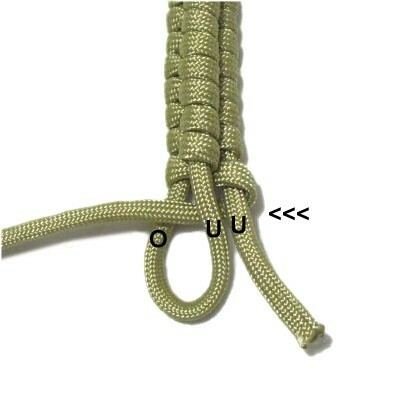 Secure the crossing point of the loop and the center fold, pulling the loop taut as you do so. The tail should be secured with tension, too. 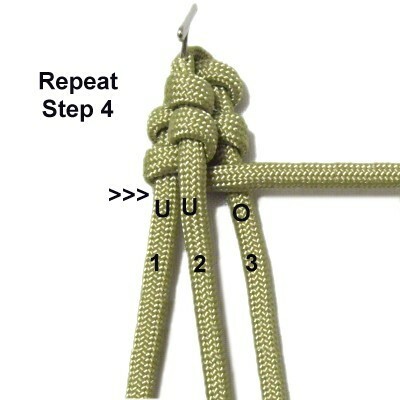 Segments 1 and 2 are the loop, and segment 3 is the tail. Step 2: Fold the working end under segments 2 - 3, and over segment 1, heading right to left. Tighten the area where it curves around segment 3. 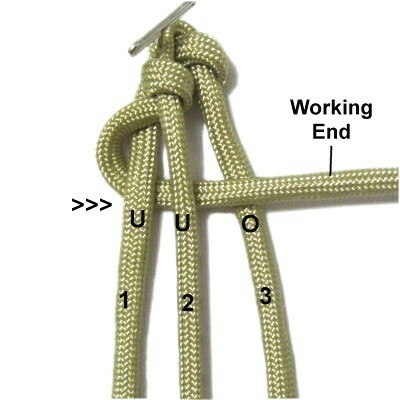 Step 3: Wrap the working end around segment 2. The arrows show the direction. 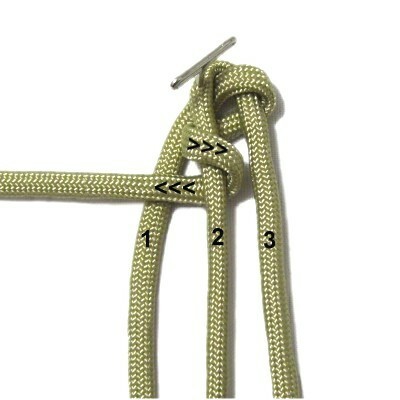 Tighten it firmly and push it close to the crossing point of the loop. Make sure the working end rests over segment 1 when you are done. Step 4: Fold the working end under segments 1 - 2 and over segment 3, heading left to right. Pull the cord firmly to tighten the area where it curves around segment 1. 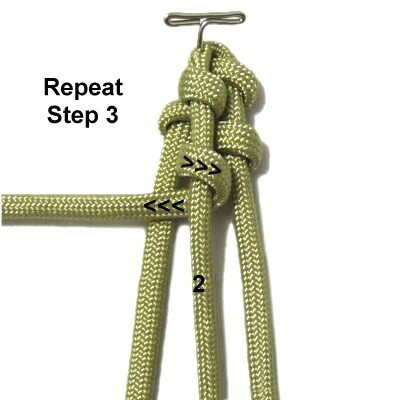 Designer's Tip: It's better to tighten each area of the Rattlesnake Bar as you progress, especially when you wrap around the middle segment in step 3. You should push everything close together to eliminate any gaps. Step 8: Repeat steps 2 - 4 several times. 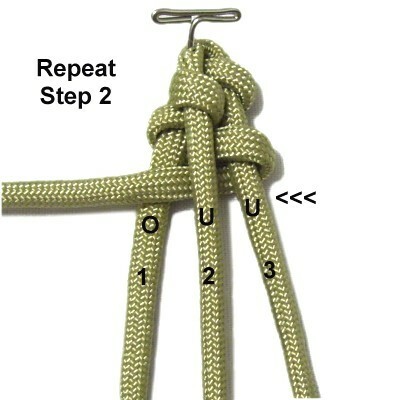 Stop when the last knot is approximately 1/2-inch from the folded area of the large loop. Make sure you stop after completing step 4. This will give you a 1-inch loop for a clasp. Stop sooner if you need a larger loop. 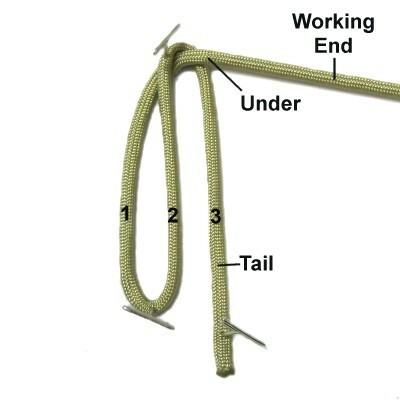 Fold the working end to the left, passing under the tail and through the loop under - over. 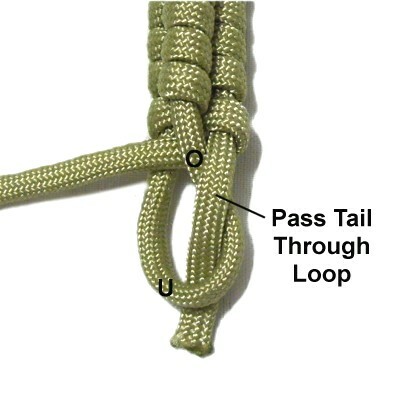 Pass the tail through the loop over - under. Step 9: Go back to the crossing point of the large loop, which is considered the top. 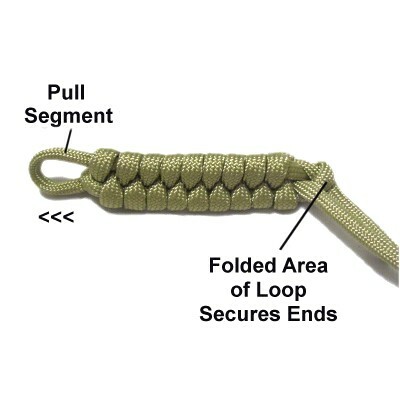 Pull one segment of the LOOP firmly, until the folded area of the loop is tight, which secures the ends. Be sure you don't pull the tail. 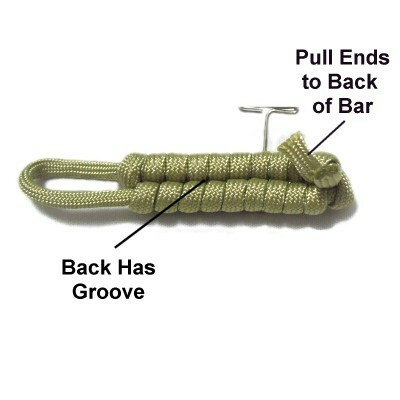 Turn the Rattlesnake Bar so you can see the BACK, which has a groove between the two segments. Pull the ends through spaces to the back. This is optional if you need the ends to form a clasp, or want to decorate them. 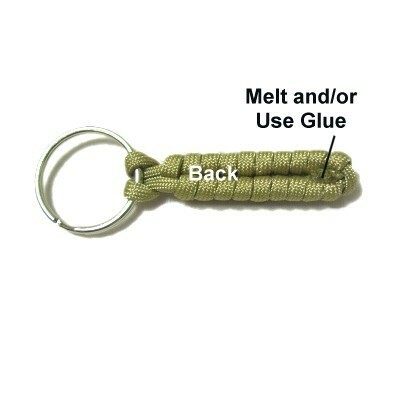 Complete any final steps, such as adding a ring if making a key chain. Finish off the ends by melting and/or using glue, depending on the type of material. Have any comments about the Rattlesnake Bar? Contact Me.